The other day I was raring to do some nail art, and I wanted a design that would help me to practice my fine line work. I recently did an interview with The Crumpet and one of the things I said was that I wished I was better at fine details in my nail art. Well, there's no time like the present to start practicing! I chose a geometric/tribal concept because consistent lines are really hard to do, and I thought it would be challenging. I really like the way that it came out. I also want to note that I used KBShimmer - Clearly On Top as my topcoat for this manicure and was very impressed. It didn't smear the nail art when I applied it, and it dried really speedily. Definitely worth looking into if you are in the market for a new topcoat. After finishing the manicure I decided I wanted to make it matte. I don't use my matte topcoat often enough! It can really transform the entire look of whatever it's used on. 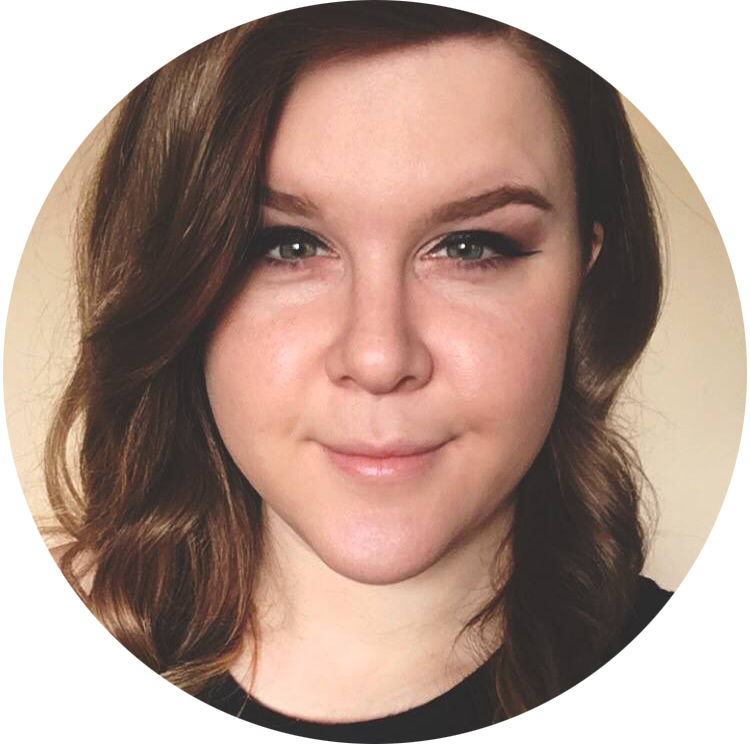 So, I added a coat of Hard Candy - Matte-ly In Love. I'm actually almost out of it, and I don't think that Hard Candy is producing it anymore. I'm going to give the OPI Matte Topcoat a shot next. Which way do you prefer this manicure? While I normally prefer glossy, I think in this case I like it better matte. Both have their advantages, though! Also I would recommend checking out the NYC topcoat. It's only a dollar and it works really well! Wow, I really love both! Maybe the matte a little more? Matte all the way. 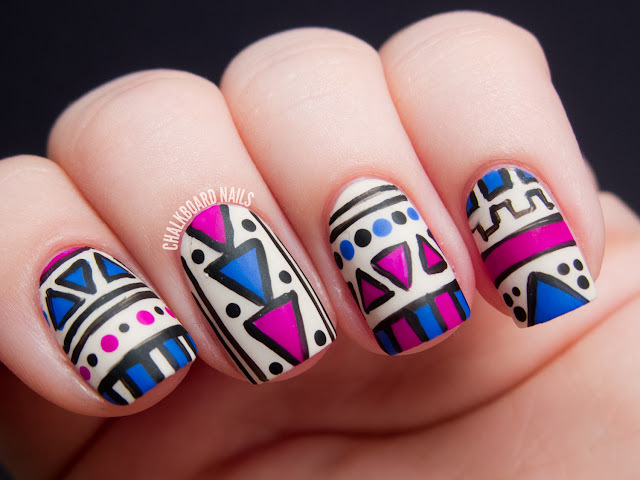 I love this design and it looks fabulous on your nails. Beautiful! I love it matte! I love the matte!! So pretty!! It looks amazing!! 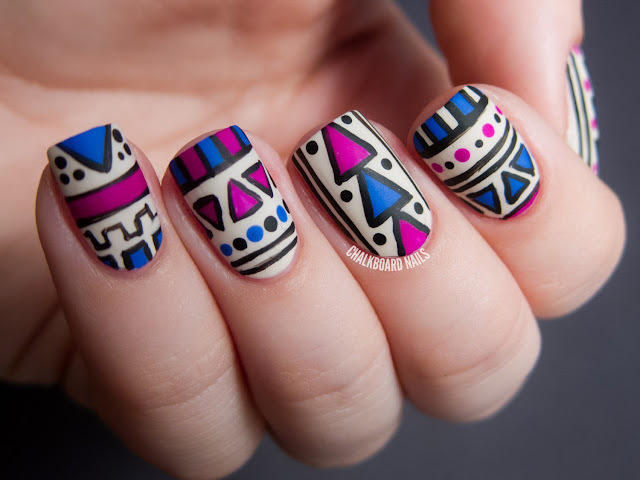 I def like matte with tribal! I love it matte! Awesome job! Thinking matte on this one. Love it! I like the matte better, don't know why but it just appeals to me more. The whole design is great through. Makes me want to do some fine line manicures too. PS I don't know if you've seen or tried NYC Matte Me Crazy Mattifying Top Coat. I love it, plus it's super cheap. A concern . Dub turbo several.0, the possibilities are endless. The design is just amazing. Do you really need any practicing? Not that you should spot, of course, just know that you are very good. Fuchsia and cobalt are such an original and perfect color combination. 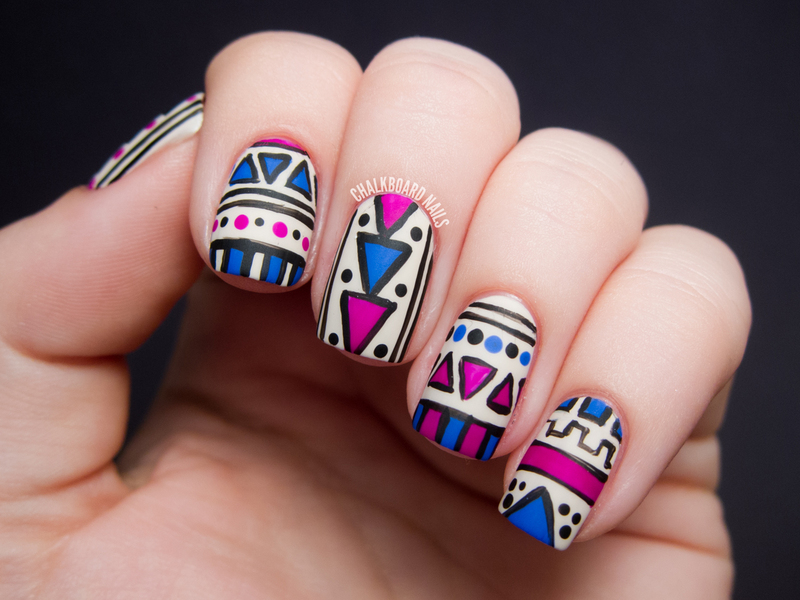 I think the matte is better because it allows to see the design better and just goes better with that tribal-aztec style. While you're looking at matte top coats, I can also recommend Essie Matte About You and butter LONDON Matte Finish. Matte! I have a massive soft spot for all things matte :) Another suggestion for a matte topcoat is the Rimmel Lycra Pro Matte Finish one - It works really quickly and has a great brush. Plus it's not horrifyingly expensive! 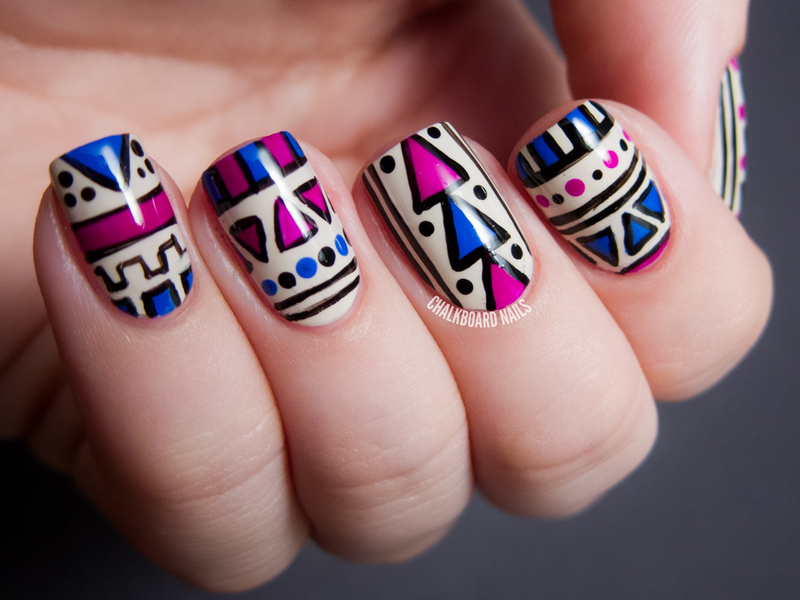 This manicure is just amazing! The print you created is just fabulous! the matte one looks so much better!! I'm definitely for the glossy but it would be great to see the coloured details glossy over the matte cream. You know, just another challenge for you! love it love it love it - matte for the win! I prefer glossy but they both look great with your design. Love the matte look - A LOT! It added more quirkiness charms to the whole look! 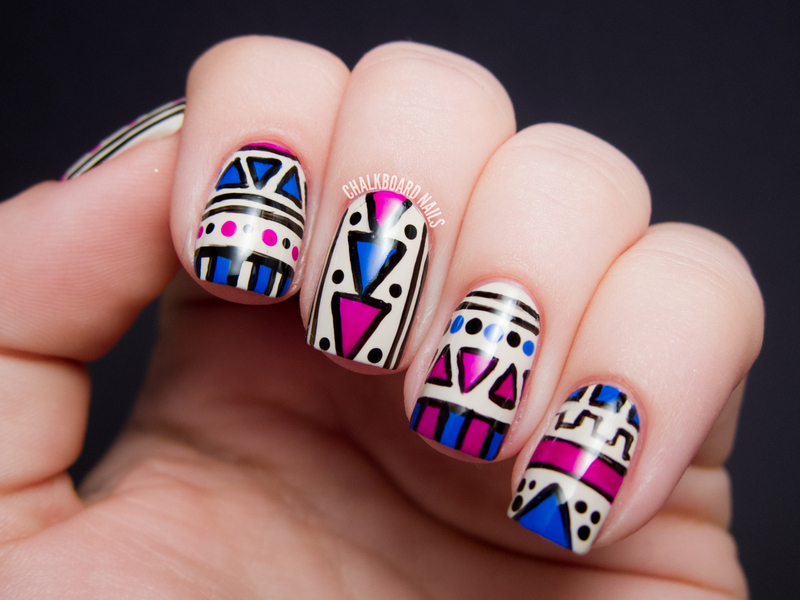 This is such a funky, quirky and cool nail art look! Super love it! Love it mattified, very cool looking! What kind of brush did you use? I need a new smaller nail art brush. The second photo in this post is the brush that I always use! I dig the matte version. That's great news! I love OPI anyway so I definitely want to try theirs out. SUCH gorgeous tribal nails. I love these. Can't decide on which i like better-matte or gloss-like them both! So gorgeous. I prefered the matte version! But both of them are perfect! I love the matte. I ran out of my Hard Candy matte topcoat, and I was pretty bummed when I went to the store to replace it and they weren't there anymore. I wish that when Hard Candy revamped their line, that they kept the matte topcoat and some of the regular polishes they had before. I love these both ways, but I definitely prefer the matte ones! Beautiful! I love the matte version - but I'm a lover of matte in general. Even for makeup! I love pretty much everything you do, but these are seriously up there as one of my faves everrr. They are SO COOL. I can't really choose between the glossy and matte though, it looks equally fantastic both ways. I'm lovin' that matte-finished mani!!!!! Fabu! ...and super job with the fine brush work! bungalows can be coded in any style about exterior architectural engineering. Stairs can be a big occurrance for the elderly. I like the matte better too. I just think the design looks better with the matte top coat. Could you make a tutorial for this? I am loving the design!! it. You want to sell yourself, not to degrade yourself. blogs published over the internet. This means put in less to this kind of type of teaching overall. The whole body's weight is hands free a resistance because of the bring of gravity. I think this would look great with Cult Nails' new Wax finish top coat!! I'm in love with this mani, and I need the pink! BEAUTIFUL! I have to chime in with my support for the NYC Matte Topcoat. It's WELL worth the 99¢ investment, LOL. I'll have to check out My Vampire is Buff, sounds like a rare good white/cream shade. I really like it! Also, bummed to hear Hard Candy isn't making theirs anymore D: it was always the best of the ones I'd tried. With their rebrand and plunge into being relevant for the latest trends, I can't imagine why they'd stop! What did you do on your thumb? I'm in the process of doing this and I dunno what to do. .-. It was pretty similar to the middle finger! Just smaller vertical triangles.